Tanzania packs a curious mix of natural landmarks and human-made monuments. Many of its most important monuments date back to the colonial period when the country was first, governed by Germans, and later by the British. In the rural areas, important landmarks include ancient rock paintings at KondoaIrangi, natural monuments and lakes like Mount Meru, Kalambo Falls, OlDoinyoLengai and Ngorongoro crater. But what are the key monuments in Tanzania today that remind people of its history? Uhuru is freedom in Swahili. This monument, located at MnaziMmoja park in Dar es Salaam, commemorates the country’s independence from colonial rule. The actual torch was placed at the top of Mount Kilimanjaro in 1961. Over the years, it has become nothing short of an iconic symbol appearing on the country’s currency. The Askari Monument, on Samora Avenue, Dar es Salaam, depicts an armed bronzed soldier from World War I, as he points his gun towards the harbour. It commemorates the role played by black African soldiers during the war of 1914. Dating back 50,000 years, the KondoaIrangi paintings are said to be the most beautiful collection of their kind in the world. The spread of 200 different sites, more than 1,600 paintings cover the entire hilly area of KondoaIrangi. The oldest, with images of human figures, animals, and rivers dates back to over 70,000 years. The Kalambo falls straddles the Zambian Tanzania border and drops some 240 meters and ranks as the tallest waterfall in Africa. The best time to visit the falls is during the long season as this is the heavy rainfall season. The heavy rains make the cascading waters particularly strong. Located on a conservation area that covers the rich volcanic landscape, the Ngorongoro crater is a sight to behold. With abundant wildlife, its lake and a high concentration of predators, it forms a self-contained safari destination all of its own. The crater’s huge bowl is 20km wide, and the deepest point is 600 meters. This makes it the biggest caldera in the world. At the bottom of the bowl, is a curious mix of ecological environments including rainforests, swamps, and a soda lake. This is a popular destination for tourists visiting the northern safari circuit in Tanzania. 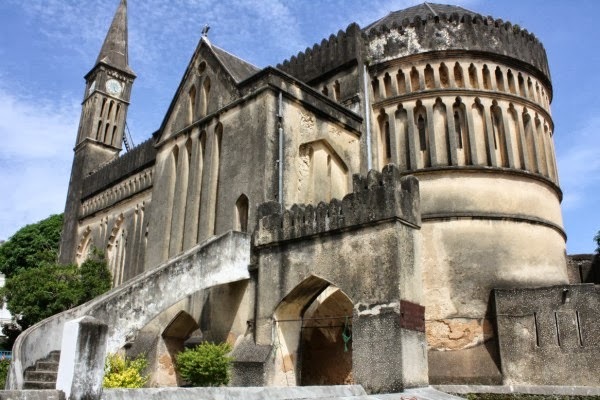 At the duskof the German rule, they gifted the city of Dar es Salaam with the Azania Lutheran Church. Today, it is one of the most distinctive landmarks in the city featuring a red tiled belfry that towers the surrounding buildings. You are also welcome to relax on the church’s gardens before heading back to the tour of the city.